As we all probably know by experience, making a New Year’s resolution is an easy enough task, it’s sticking to it that is so difficult. People have been making, and breaking, resolutions for many years, the practice goes back thousands of years. And knowing human nature, it will continue for thousands of more years. The odds are not very good for those who do make New Year’s resolutions, only about eight percent will achieve them. With those odds, you might be hesitant to make any resolutions at all. But that is just the kind of attitude that won’t better yourself. New Year’s resolutions present a big opportunity for self-improvement. It gives you the chance to reflect on the mistakes of your past and make positive changes in your life. For example, you made a terrible mistake and got a really bad tattoo. 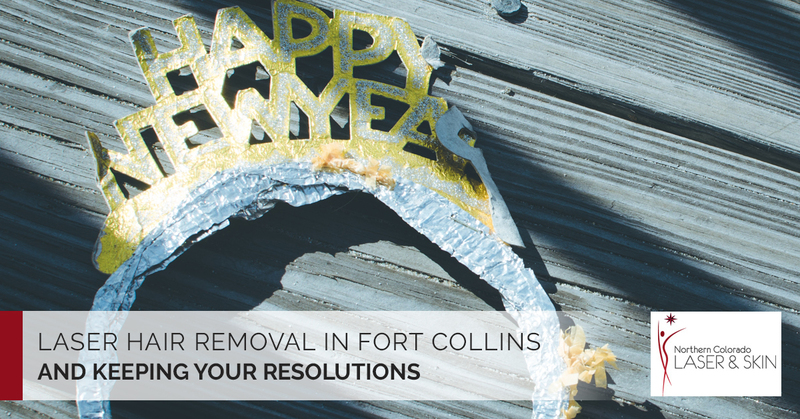 So this year, resolve to visit Northern Colorado Laser and Skin in Greeley for tattoo removal. You might also wish to resolve never to shave your legs again by utilizing laser hair removal in Fort Collins. Both very admirable New Year’s resolutions. You may also have resolved to eat healthier in the new year, or to lose 30 pounds. These are resolutions just as admirable, but much harder to follow through on. What you need are a few tips on how to keep your resolutions. You will find it quite difficult to stick to good behaviors all of the time. Because of this, there is nothing wrong with expecting some level of failure. Instead of being discouraged when you break a resolution, learn from it and simply move on. That’s right, if you resolve to never eat another Triple Whopper and January 7th finds you at Burger King ordering a Triple Whopper, pound down that bad boy and resolve to never eat another one. Think hard about your resolutions before you make them and ask yourself if they are realistic. If you set a goal of losing 40 pounds in one or two months, you are setting yourself up for failure. Instead, resolve to lose a few pounds every month until you lose 40 pounds, which could take up to a year or longer. You will feel much better about yourself if you resolve to lose three pounds a month and wind up losing four compared to resolving to lose 20 pounds in a month and only losing four. Go ahead, post your New Year’s resolutions on Facebook and Instagram for everybody to see. Telling people your resolutions will make you more reluctant to abandon those goals. You friends on social media can encourage you and motivate you to stay on track and achieve your goals. Giving yourself a reward when you progress in your goals increases the probability of success. Reward yourself based on the progress you have made or the times you want to quit but soldier on. Keep a journal or calendar as a reminder of achievements and what you did for yourself as a reward. Just don’t do anything that sets you back. For example, don’t reward yourself with a Triple Whopper after reaching a weight-loss goal of three pounds. Asking for and accepting help from friends, family and others who care for you will strengthen your resilience. There will likely be a time or two when you will feel overwhelmed by your goals and feel like they are unattainable. If this does happen, it might make sense to seek professional help. A professional can help you deal with emotional issues and change unhealthy behaviors. Just as a little child can be distracted by a shiny object and will stop crying, you need to be distracted from your old habits with new ones. If you resolve to stop drinking alcohol, just don’t stop drinking, replace it with a healthy alternative. For example, skip the white Russian after work and hit the treadmill instead. If your New Year’s resolutions include enhancing your beauty, getting a bad tattoo removed or laser hair removal, contact Northern Colorado Laser and Skin and get started today.